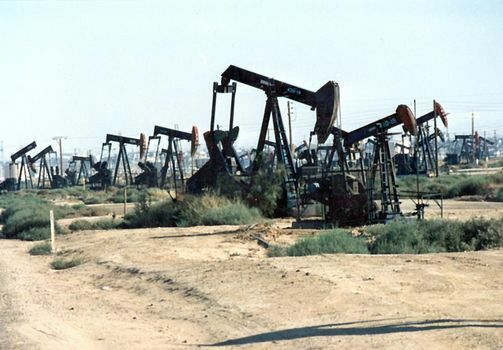 Kern County has been a major oil producer since 1900. 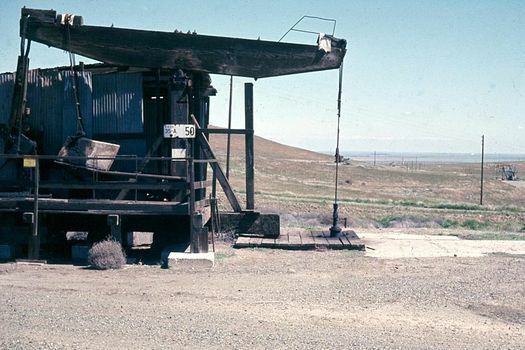 The technology of production and the oilfield landscape, however, are not what they were. 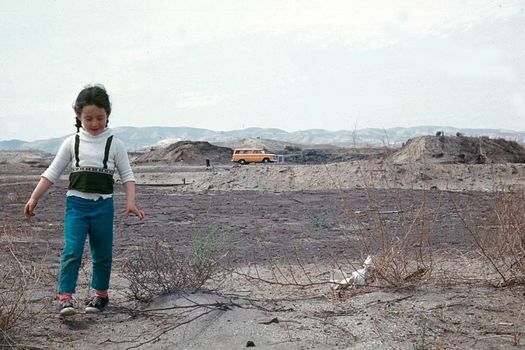 Here we have a few pictures of the "new" landscape and a collection of photos taken in the late 1960s of the "old" one, before it was largely demolished. 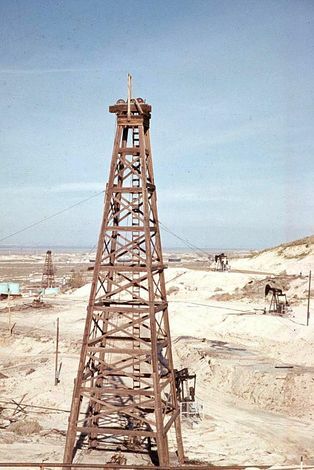 Redwood derricks, gone now, replaced by mobile rigs. 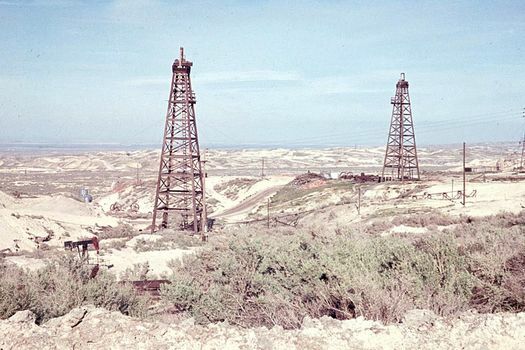 While they lasted--and they were scarce even in the 1960s--they indicated property lines, because oilmen put these rigs flush against their neighbor's land. That way, you could capture a bit of your neighbor's oil. The favor was usually returned, so two lines of derricks would march along the boundary. 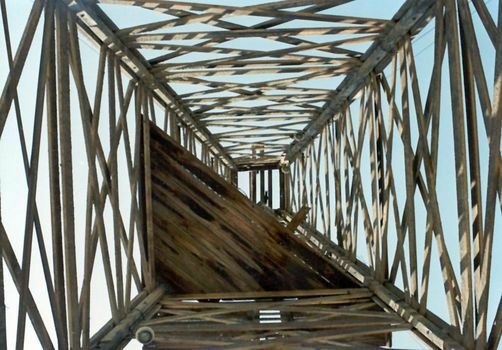 Not a fun ladder to climb, but some oilmen preferred wooden derricks to steel ones, which gave little warning when overloaded. 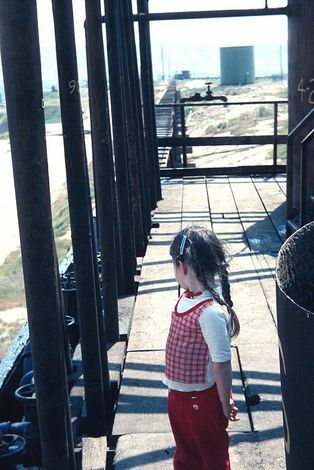 The redwood derricks groaned and before collapsing went from a square to a diamond shape. You had time to get down. A view from the bottom up. A transitional form, especially common in the 1930s. Steel replaced redwood, only to be replaced by portable masts, trucked in when needed. For many years, both derricks and pumps survived as companions. Then, for a period, the old pumps survived minus the derricks. Even the old pumps like this redwood one are gone now. 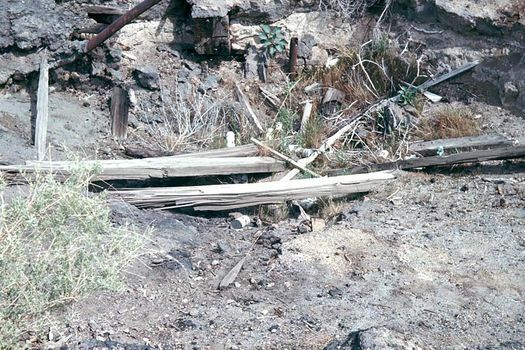 Walking beams like this did more than drive pumps. In the days before drills, they raised and lowered the heavy percussion drills, which basically bashed their way from the rock. Power to drive these beams came in the early days by oil-fired boilers, rather than electricity. 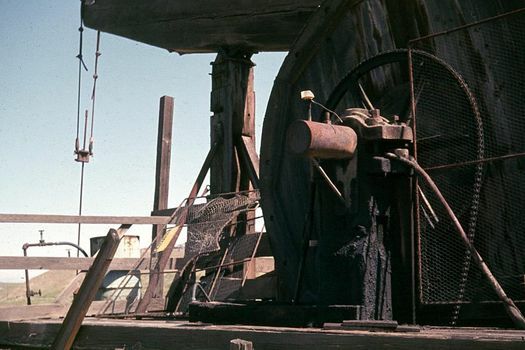 The 6-by-6 inch beam standing vertically near the well is a headache post, designed to spare the driller a good braining if he was standing near the well when the crank apparatus failed. Close up of the motor-driven drive chain and the huge band or balance wheel. The speed of rotation was slow, even dignified. 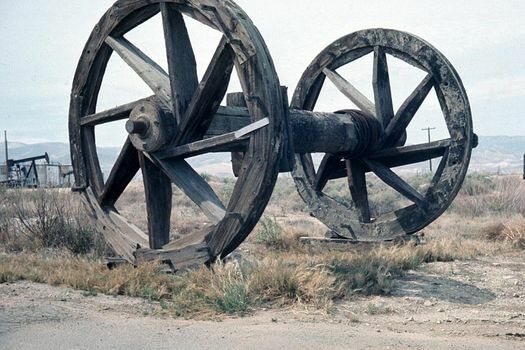 These are bullwheels, giant spools on which drilling cable was wound in the days of percussion-tool drilling. 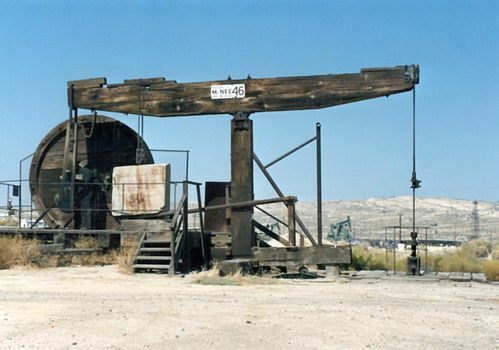 This is a "power," a central motor driving a dozen wells by cables radiating in all directions. 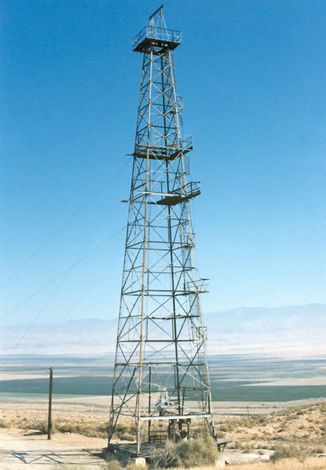 Located in the Kern River field, east of Bakersfield, this was just about the last "power" operating in the county at the time the photo was taken in the late 60s. The heyday of "powers" was short, as the cost of electric motors and electric power fell enough to justify motors at every well. 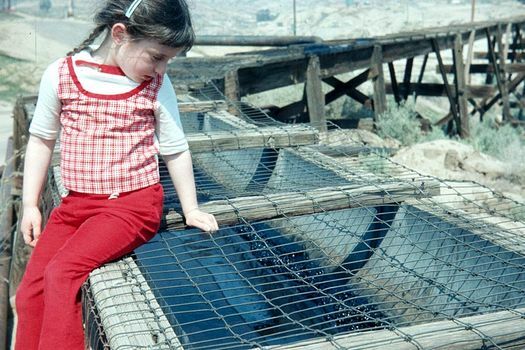 Many collection lines in the Kern River field converged and discharged their oil into an open flume, seen in the background. 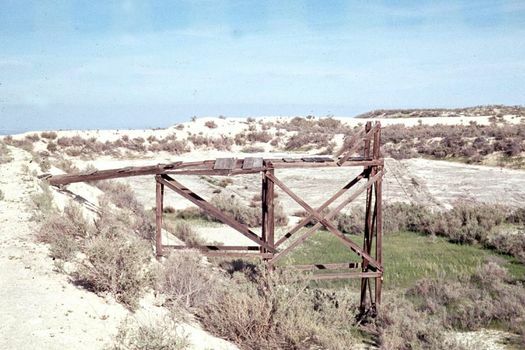 Here's the same flume as it comes across a wooden trestle. Evaporation? Carcinogenic? At least they've put some wire over the top to keep birds out. 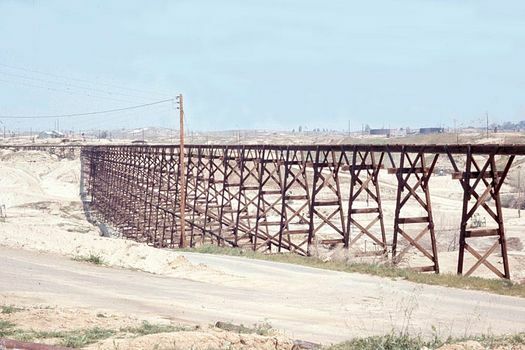 The trestle is a bit light for a railroad. The actual bore of the Lakeview Gusher, over on Kern County's West Side. By some accounts, the Lakeview was the most prolific gusher of all. 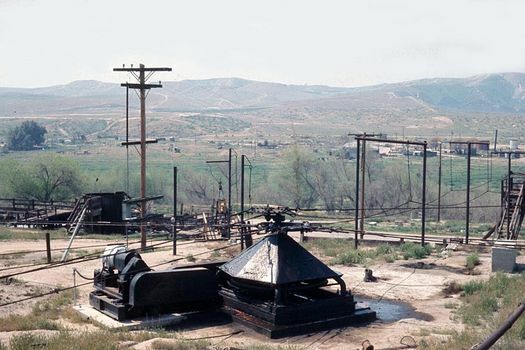 Part of the oil was conveyed to this hastily erected reservoir. 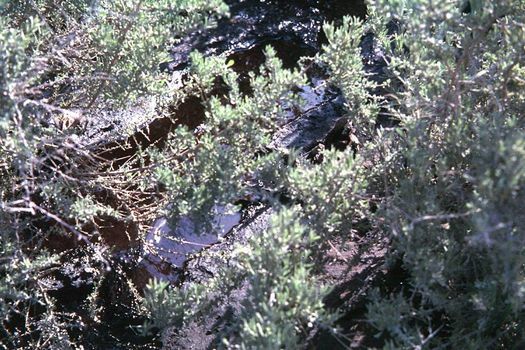 Even in the 1960s, oil made creeks like this one, at McKittrick, run black. Nobody paid much attention. Late in the 60s, secondary recovery techniques were introduced to Kern County. 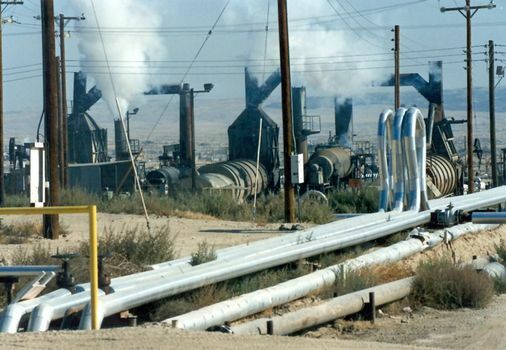 Thousands of pumps went to work extracting heavy oil made less viscous by downhole pumping of hot steam. Steam generators and distribution lines. It's a bit reminiscent of early 19th century paintings of industrial hellscapes.